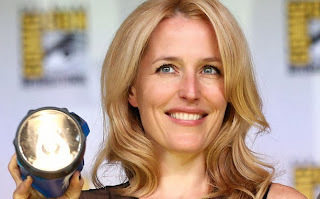 Gillian Anderson is returning to the genre that made her a cultural icon – but it’s not on television. The newest project from the star of The X-Files is a book franchise called the EarthEnd Saga, a collaboration with co-writer Jeff Rovin, a prolific geek whose extensive bibliography includes works in the best-selling Tom Clancy’s Op-Center series. The first novel, entitled A Vision of Fire, will be published in October by Simon & Schuster through a new imprint devoted to literary and speculative fiction across all genres called Simon451, a nod to legendary author Ray Bradbury’s dystopian/sci-fi classic Fahrenheit 451.